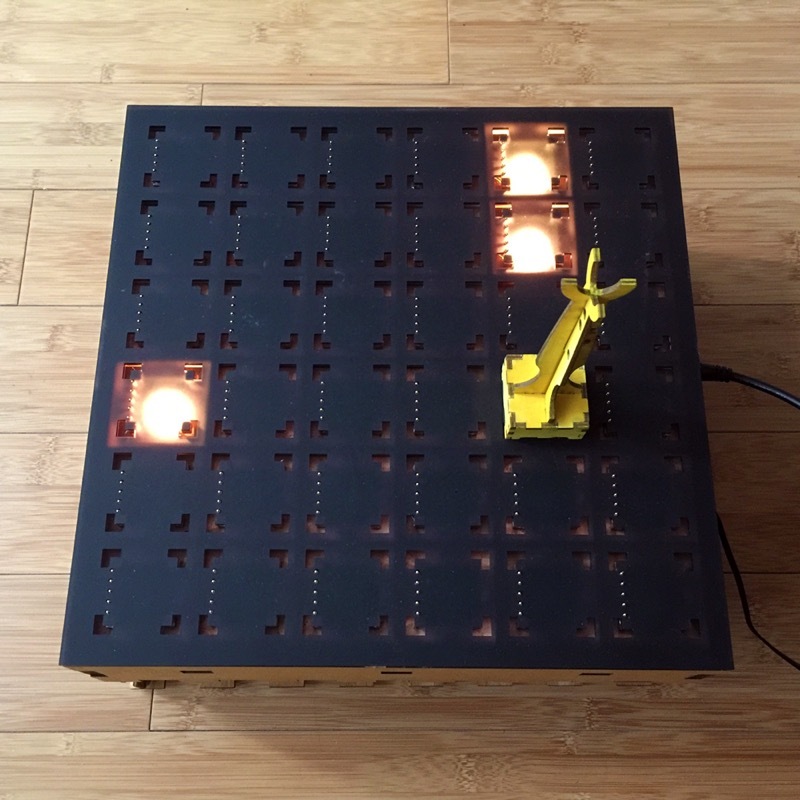 Beatfield is as an exploratory game of an audio visual landscape where players could control music and lights by placing tangible objects on a wooden box. The goal of this project was to create a sort of Rorschach interface, onto which the user would project their own personal meanings. In other words, the idea was to build a single piece of interactive design that could stimulate a variety of interpretations. A number of design choices were made to make the interaction more enigmatic and to allow players to appropriate the game through personal interaction strategies and give it personal meanings. 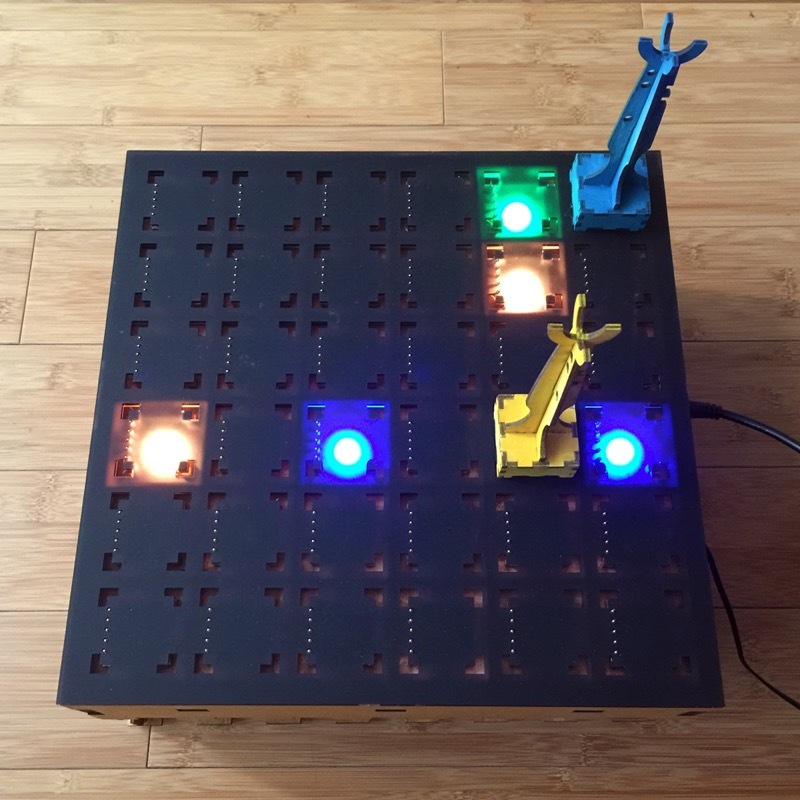 Players can interact with the device by placing tangible objects on the surface of the system. The objects are equally divided into two colour, yellow and a blue, and each colour is composed of one king and three pawns. 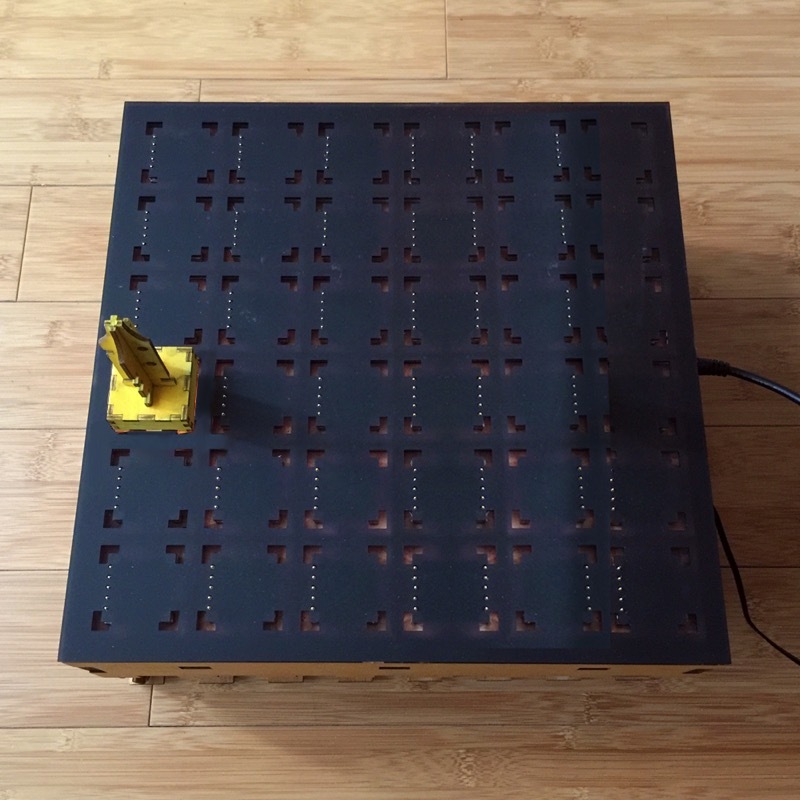 Each cell of the surface is associated to a specific rhythmic pattern, which is played every times a pawn is placed on top of it. Pieces of the same colour have the same timbre (yellow pawns sound the same, and so do the blue). As opposed to pawns, kings don’t play any sound but have an influence on lights: when positioned on a cell, a king lights up three cells with its colour. Those three cells have a rhythmically-alike pattern, meaning that they sound harmonic when they play together. Lights affect the timbre of the rhythmical patterns when a pawn of the same colour is placed on top of it. In this case, that specific rhythmic pattern has an enhanced harmonic spectrum. In some cases, when both kings are placed on the surface, they could be rhythmically affine to the same positions. In such cases, these positions would light up with green colour (a combination of yellow and blue). Each cell is associated with a specific rhythm, which is played once a pawn is placed on top of it. Once positioned on top of a cell, the king lights up three cells with its colour. The rhythm associated with these cells is similar to that where the king sits. In other words, the king suggests favourable positions. When a pawn is positioned on top a cell with its same colour, its harmonic spectrum is enhanced. When both kings are on the panel, they are sometimes affine to the same cell(s). In this case, a green colour lights up.